Blondie and Brownie: Oklahoma Joe's. For the Win. My long weekend jaunt to Kansas was not going to be complete without at least one meal in Kansas City. We're talking about a girl who annually waits around for hours for precious BBQ bites; I was ready to "borrow" a car if necessary. 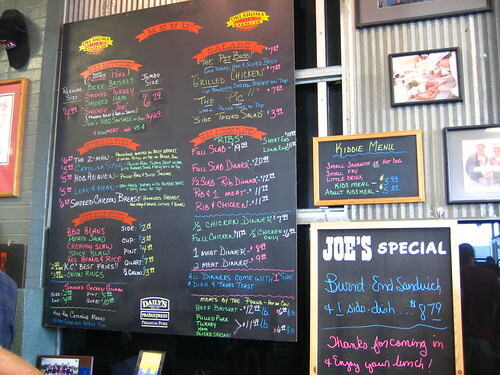 Kansas wanted to take me to Oklahoma Joe's, and since that was on the list James Boo recommended to me (the guy KNOWS BBQ,) I was doubly down to earn some foodie stripes. As we rolled up to the gas station-yes, it's adjoining a gas station-the line was out the door. 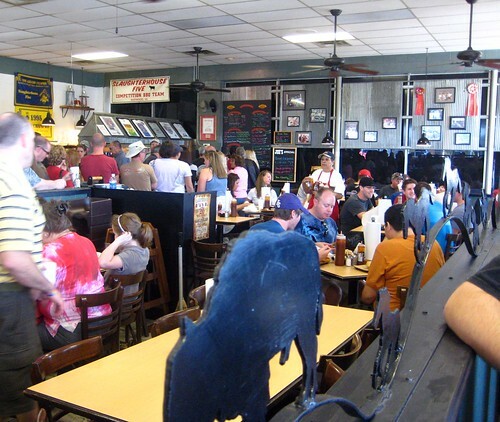 A little line wasn't going to deter this lady, especially once I spotted the slabs of ribs, fries, and sandwiches. Nom, nom, nom. A good 45 minutes later, we were staring at the big board menu when I noticed that this was my lucky day. See the sign off to the side? 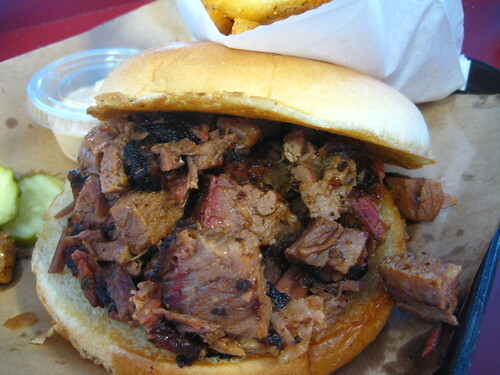 It says "Burnt End Sandwich." Sweet Jesus, the angels above and my father below were watching out for me. Look at those juicy, tender burnt end chunks. Kansas got the stink eye when he tried to take bites, all of the crunchy fat and meat of this baby was mine. I put a good amount of sweet sauce on after taking this, before it managed to hit spots I didn't even know I had. This may quite possibly be the best sandwich of my life, so far. 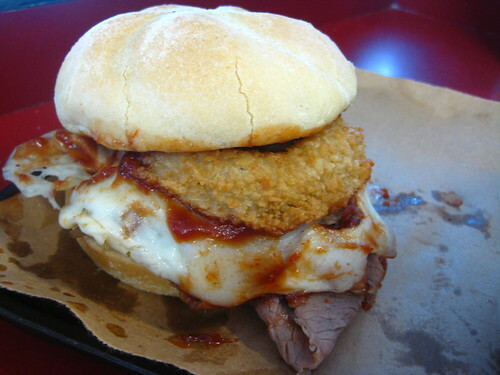 Plus, he had his own sandwich, the Z-Man: brisket, provolone, and two onion rings. It's sloppy, but it's good. I remember only taking one bite, I was too focused on my sandwich. Both of us were greatly impressed by their nicely spiced fries, those are a definite side dish for the awesome sandwiches. This is my all time favorite! Glad you were able to try it out!! Now I think I have to go for lunch!! Just stopping by from OK Joe's FB page. 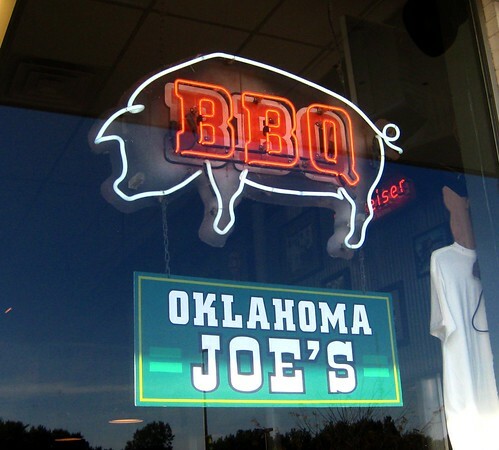 I live in Kansas City and Oklahoma Joe's is my all time favorite BBQ place. There are a lot of good spots in KC but none can compare. Their pulled pork is to die for.